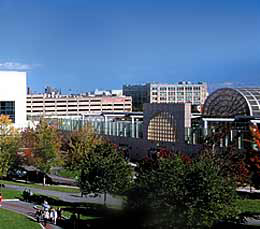 Northeastern has two main parking facilities for visitors, West Village Parking Garage for prospective students and their families, and the Renaissance Parking Garage for general campus visitors. Please select the "Maps and Directions" link for driving directions to these parking locations. Admissions parking at West Village Parking Garage Complimentary admissions parking is available during office hours on a first-come, first-served basis in the West Village Parking Garage, 20 Leon Street. Please inform the garage attendant that you are visiting the Admissions Visitor Center. General parking at the Renaissance Parking Garage Visitor parking is available at the Renaissance Parking Garage, 835 Columbus Avenue. There is a fee to park in this facility. 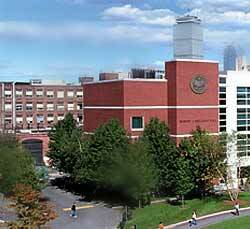 With the exception of our Boston Financial District Campus, there is ample free parking at all other campus locations. 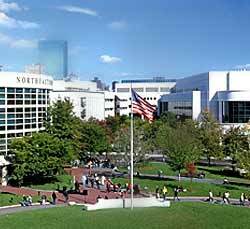 Northeastern is accessible by subway via the Green Line of the MBTA. From downtown Boston, take an "E" train outbound to the Northeastern stop, the first stop above ground. The campus can also be reached from downtown via the Orange Line by taking any train going outbound to Forest Hills and getting off at Ruggles Station. Commuter rail lines connect with the Orange Line at Ruggles Station, Back Bay Station, and North Station.